Cover art for the book was created by former BW&BK graphic artist Hugues Laflamme, while the video trailer above features music composed exclusively for the project by After Forever guitarist / death vocalist Sander Gommans. The voiceover was provided by Trillium / Avantasia vocalist Amanda Somerville. It was shot and edited by video director Andreas Spitz. I’ve known Sander for a long time and during a visit to Holland, I mentioned my plans to finally complete GRIM and publish it independently. He had a vague idea of what it was about and made the off-the-cuff suggestion of building an album around it. That was a bit too ambitious for a project that hadn’t even gotten off the ground, but the idea stuck with me, and when I decided that a video trailer might help with promotion I gave Sander a call. I explained what I wanted, and he came back to me a week or 10 days later with a piece of music that exceeded all my expectations. Some minor tweaks, the addition of some bass, one death metal howl (his idea), mixed and mastered, and it was in the can. Asking Amanda to do the voiceover was a no-brainer. I’ve known her seemingly forever and I’ve always loved her voice. The text is mine and I had a very basic idea of what I wanted, and what she delivered is simply brilliant. Just what I wanted. Somehow she managed to squeeze in the time to do a few takes in between preparing for Avantasia’s pre-Eurovision performance, getting ready for a world tour, and being a mother. I’m grateful to everyone involved behind-the-scenes for taking the time to help me out. Go to this location to check out the Kickstarter campaign, which features the prologue from GRIM – My Way To Hell and a reward system featuring limited edition merchandise. 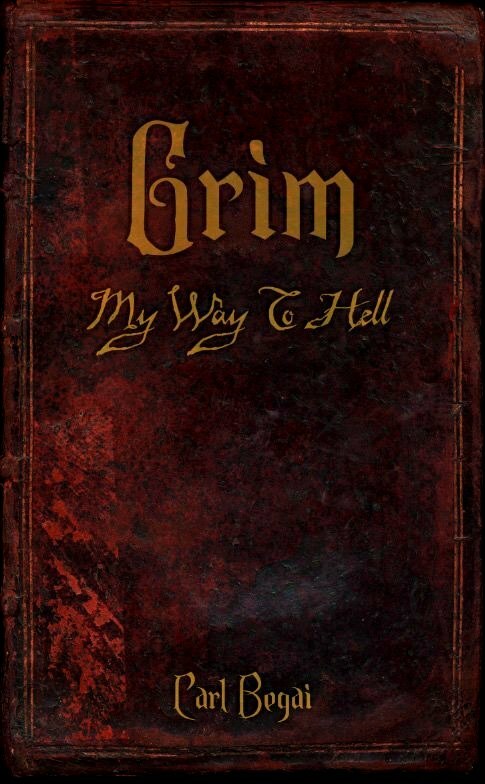 Check out the official GRIM – My Way To Hell Facebook page here.